Tiger Woods is no stranger to controversy, and it seems the drama has followed him to the Masters. Woods, currently the number one golfer in the world, received a two-shot penalty on Saturday for taking an illegal drop on the 15h hole during Friday's second round. The problem? Many are buzzing in Augusta, Georgia, where the tournament is taking place, that Woods should be disqualified for signing an incorrect scorecard after his round on Friday. For those who don't know the crazy rules of golf, let's back up. Woods' shot to the 15th green bounced off the flag stick and into the water. Lindsey Vonn's boyfriend then had a few options as for what he could do next. He decided to return to the original spot from which he played and drop the ball "as nearly as possible'' from where he played the third shot. "I went back to where I played it from, but I went two yards further back and I took, tried to take, two yards off the shot of what I felt I hit," Woods said after the round. But was two yards enough? Apparently it was since the committee has simply ruled a two-stroke penalty, not disqualification. "At hole #15, I took a drop that I thought was correct and in accordance with the rules," he wrote. "I was unaware at that time I had violated any rules. I didn’t know I had taken an incorrect drop prior to signing my scorecard. Subsequently, I met with the Masters Committee Saturday morning was that there was no violation, but they had additional concerns based on my post-round interview. After discussing the situation with them this morning, I was assessed a two-shot penalty. I understand and accept the penalty and respect the Committees’ decision." The buzz in the clubhouse in Augusta, Georgia, seems split as to whether Woods should have been disqualified. Many seem to think that Woods definitely should not be allowed to play today. "It's absurd," one pro-golfer told omg!. "Tiger should withdraw." However, there are a lot of members who understand the difficult decision. "That is what the committee is for," is what one insider told omg!. "People will be upset with either decision. There is no pleasing the public." That seems to be the sentiment among many at the Masters on Saturday. One person who is standing by Tiger's side: Vonn. The superstar skier, who is recovering from an injury sustained earlier this year, has been hobbling around the course, cheering on her boyfriend, all weekend. Sporting a black knee brace, Vonn has looked on with pride as her new love competes. "She has been great with him," a source who knows the couple tells omg!. "They are the real deal. Of course she knows about his past, but they actually make a great couple. They have much more in common than he did with [Elin]. I think this will work out." 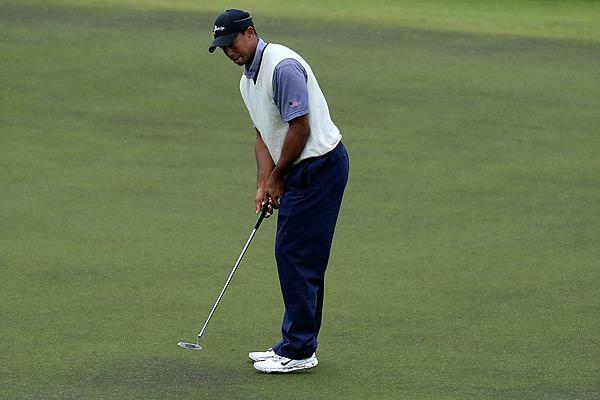 The Masters continues on Saturday with Woods vying to win his 15th major championship.